A good groove on the bass guitar can make you tap your feet, bob your head, and snap your fingers. A groove is constructed of several elements, the first being the groove skeleton, and you can use these different elements to create your own earth-shaking grooves. The root of the chord: You usually play the root as the first note of your groove. The root of any chord (or scale) is the most important note in that chord — it’s the note your ear gravitates toward (the most satisfying note). 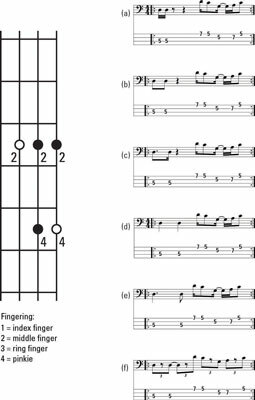 The second note, or the other half of the groove skeleton, is usually a chord tone (root, 3, 5, or 7) that further defines the chord. With these two notes, you give the listener a good idea of the harmony in a tune. The pulse (tempo) of the tune: Music has a certain pulse. The pulse is the speed at which you count the beats in a measure (1-2-3-4) —the speed at which you tap your feet in time with a tune. The pulse can be fast, slow, or something in between. The time that elapses between the first and second notes of the groove skeleton establishes the pulse for the groove and for the song. It tells the listener how fast the music is. The feel of the rhythm: You can divide a beat only so many ways: into quarters, eighths, sixteenths, or triplets. Triplets divide a beat into three equal parts. When you choose the division of the beat for your groove skeleton, you signal the feel of the groove and song to the listener, whether it’s funk, Latin, or rock. The feel has nothing to do with tempo. For example, a Latin song can go at a fast tempo or at a leisurely pace. On the other hand, different feels can be applied to the same tempo. A feel can give the listener a sense of urgency or a sense of laziness in a tune, all without changing the overall tempo of the music. Notice how the tempo for all six of these grooves remains the same. Also notice that all six grooves use exactly the same notes. Even so, as you listen to them, pay special attention to how very different they are from each other. Each groove has its own unique characteristics, created simply by slight changes in the rhythm of the two notes in the groove skeleton. This variation shows the power of the groove skeleton: If you change the groove skeleton and leave everything else exactly the same, you still end up with a completely new groove. In this audio track, the groove skeleton is the only thing that changes from groove to groove. How important is the groove skeleton? It’s so important that you can accompany an entire song on your bass using solely (or is it “soul-ly”?) the groove skeleton. Doing so isn’t just an arbitrary exercise, either. It’s a perfectly legitimate and successful method of playing bass on a song. Need proof? Just listen to the hit “Stand by Me,” one of the top rock ’n’ roll hits of all time. And plenty of modern dance hits operate on the same premise of using just the groove skeleton alone on the bass with little else. When you’re learning a new tune, starting with just the groove skeleton is a great way to get to know its harmonic structure — the movement of the roots of the chords — without having to worry about playing a complex groove on each one of those chords. You can always add notes to the groove later as you become more familiar with it. Listen to a song that’s accompanied by only the groove skeleton. To play it with the audio track, all you need to do is find the roots of the chords on your bass neck and play the groove skeleton for each root. Are you comfortable playing along with the bass on the audio track? If so, pan it out and be the only bass. Player beware! Space is the most difficult thing to play, and if you’re playing only the two notes of the groove skeleton, you have plenty of space to contend with for the remainder of the measure.